‘Tis the season of crazy schedules! AND, if you are anything like us, ’tis the season of holiday parties. SO MANY HOLIDAY PARTIES! With everything that needs to be done, I need no hassle recipes to make. Sometimes it’s a quick dinner, like this Hawaiian Ham and Pineapple with brown rice. It can be made in under 15 minutes, which was perfect on Wednesday when we had to go grocery shopping for our Friendsmas tonight. 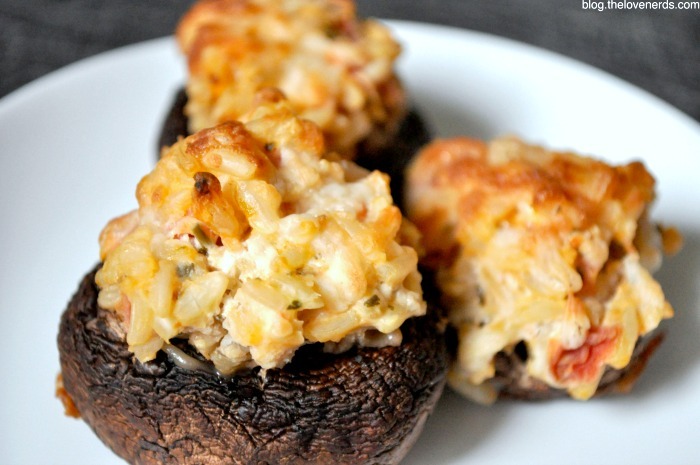 Sometimes its an easy appetizer to bring to a party, like these Italian Goat Cheese and Tomato Stuffed Mushrooms. I made these stuffed mushrooms for my husband’s work holiday party, and I was convinced they weren’t going to turn out. See, I’m fairly new to the world of mushrooms. My family hates them, so never once were they in my house growing up. Bryan and his family like them, though, so I have slowly tried them over the last few years, learned to like and then love them, and now am learning to cook them. With so many yummy ingredients, I don’t know why I doubted the recipe at all! As soon as they came out of the oven, Bryan popped one into his mouth. Then, a second one. I had to finally slap his hand away when we went for a third. They were for a party after all. Since he loved them so much, I am thinking of making them again for New Year’s Eve. 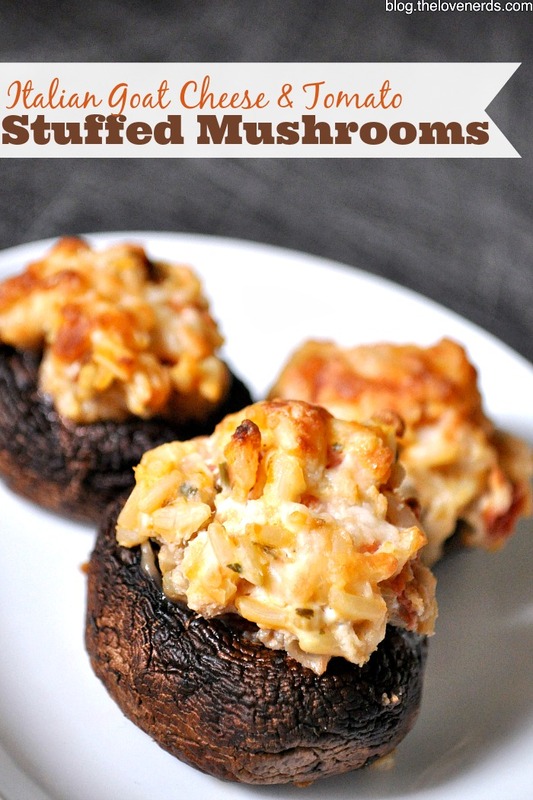 We have decided to spend the night just ourselves this year, so I’m thinking a nice red wine, steaks, sweet potatoes, and these stuffed mushrooms sound perfect! Hopefully Bryan will save me some to eat myself! So now to the recipe so you can make them, too! 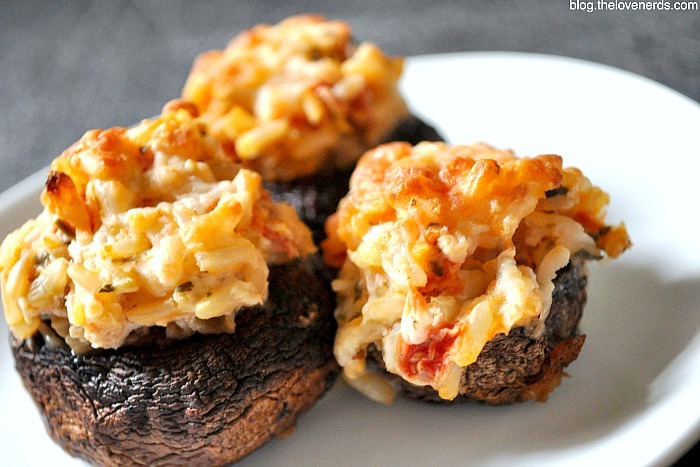 These Italian Goat Cheese and Tomato Stuffed Mushrooms have a creamy, rich flavor that everyone will love! These make both a great appetizer and side dish! Preheat oven to 425°F. Line a baking sheet with sides with parchment paper. Cook Minute Brown Rice, following their instructions. In a bowl, mix cooked rice and goat cheese until well combined, Add in tomatoes, garlic, salt and breadcrumbs. Fill each mushroom with rice mixture. 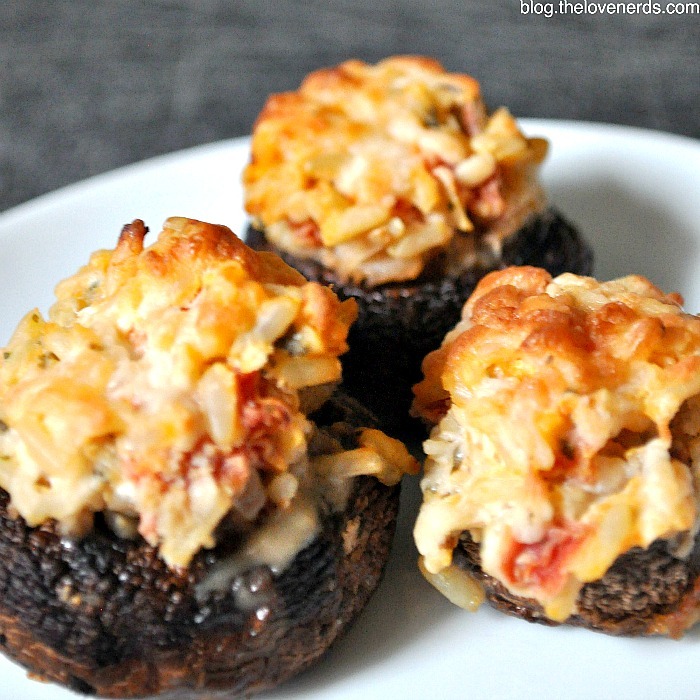 Place mushrooms on baking sheet and sprinkle each with cheese of choice. I really love Minute® 100% Whole Grain Brown Rice! The flavor is really rich and it’s the more nutritious option. Plus, it’s ready in 10 minutes! We always have a box in the pantry as a go-to ingredient, perfect as a side dish with chicken or in stuffed peppers. The options are endless! There is, of course, the classic Minute® White Rice, as well as Minute ® Multi-Grain Medley and MORE. Visit Minute® Rice for over 400 recipe ideas, great for any day of the week and any time of the day, and more information about the Minute® Rice family of products. This shop has been compensated by Minute Rice. All opinions, recipes, and food photos are 100% mine. Celebrating the Magic of Christmas with #NorthPoleFun! These look delicious. Goat cheese makes everything good!